Wednesday September 22nd 1926 I worked on the rug some in the forenoon. Had letter from Hattie. I went to Mr Thomas funeral at The Presbyterian church in the afternoon. I was at Tom McKinstrys while the folks went to Green Valley. Wrote Ott in the evening. Callers here till bed-time. Thursday September 23rd 1926 It rained all day. I worked on my rug. I did not feel very well. Lydia phoned Laura about it and Dr Fachler sent me some medicine. I went to bed early. Friday September 24th 1926 It rained part of the day and turned cooler. I worked till noon on the rug. Then devoted the afternoon to getting ready to go away tomorrow. I wrote Hattie and Edith. Letter from Blanche Black. 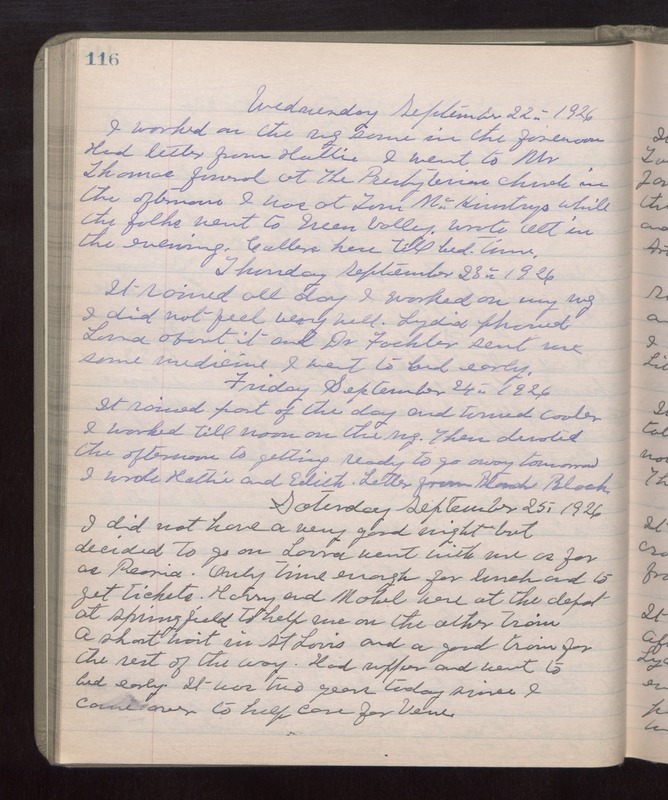 Saturday September 25th 1926 I did not have a very good night but decided to go on. Laura went with me as far as Peoria. Only time enough for lunch and to get tickets. Harry and Mabel were at the depot at Springfield to help me on the other train. A short wait in St Louis and a good train for the rest of the way. Had supper and went to bed early. It was two years today since I came over to help care for Vene.